How much does ADT Security cost? Call now before these offers expire! Free* Alarm System ($850 value) when you activate an ADT monitored security package! Call Now! Operators are standing by. Open late every night! 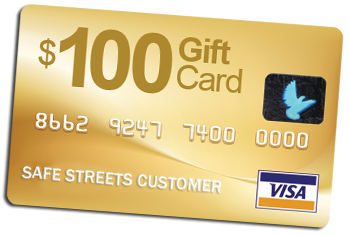 We are currently offering a $100 Visa Gift Card from Safe Streets USA for new customers. Contact us today to sign up for the leader in home security and help put money back in your wallet. Call now and ask about packages as low as $27.99 per month! including keypad, remote, and sensors. You can be protected as fast as tonight! WHILE YOU’RE OUT, DON’T LET THEM IN. Homes are most vulnerable when no one is home. Arm your system from anywhere, or put it on a schedule that fits your needs. SEEING IS FAR BETTER THAN WORRYING. Check on your kids, your pets or your stuff – and get alerts from us at the first hint of trouble. Trust Your Home Security to ADT Monitoring. You deserve the best help protecting your home and family. ADT is the number one security provider in the country. ADT has 140 years of experience and ADT home alarm monitoring helps protect over 6 million customers. ADT doesn’t let you go without monitored protection. Your home will always have help, thanks to ADT’s 4 customer monitoring centers. There is always someone there to help watch out for your home safety thanks to the inter-connectivity of these centers. ADT home alarm system monitoring delivers peace of mind by delivering around-the-clock service, no matter what. ADT has four interconnected customer monitoring centers. Alerts from your home alarm will normally be routed to the closest location. But if something happens to one of the centers, your alarm system will default to another center. You get continuous home security monitoring. WE DON’T TAKE PRISONERS. BUT WE SEND THE PEOPLE WHO DO. Experts at ADT’s monitoring centers are always ready to send police if an intruder gets into your home. Our packages are always evolving, so check with the operator for additional information. We customize most of our packages for each client to their specific needs. We don’t believe in the phrase “one size fits all.” That’s why Safe Streets USA an ADT Authorized Dealer, sends a trained consultant and installer to your home to help ensure you receive a security system specifically designed for your home and your family.